After many years of passions and endeavors, I discovered coiled pine needle baskets when I took a class where I learned to collect, prepare, dye and coil long leaf pine needles and drill wooden bases and oyster shells. Six months into making baskets I tried to attach a basket to a polished agate slice as the base. I tried knotting, crochet, tatting, gluing, encasing and every method I or any of my artistic friends could think of to connect the rocks and needles, but nothing worked for long. Nine months into my search while traveling in Peru, I saw a woman tying a harness onto a rock pendant, and asked her to teach me how. After learning her technique I brought the skill home and adapted it to my basket making; I call this harness the Margarita Stitch after the woman who taught me. Then I began collecting rocks, which I had always found beautiful, to use as bases. I process stones by slicing, tumbling, trimming, grinding and sanding rocks into shapes to use with the Margarita Stitch as basket bases. 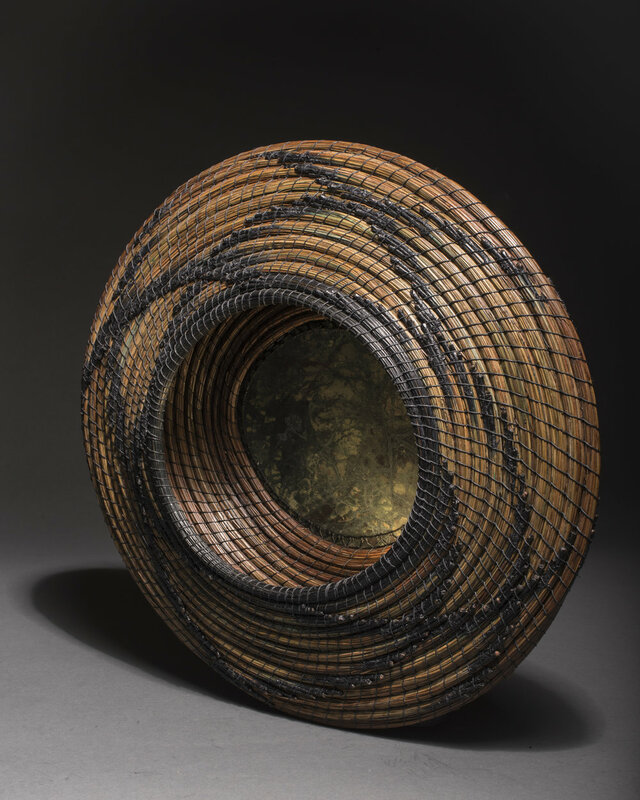 My coiled baskets are made from long leaf pine needles treated with glycerin; they are stitched with waxed linen or faux sinew onto bases made from wood, shell, or rock slices. I dye some of the pine needles and finish the baskets with beeswax.